Bwin have really gone all in with its mobile gambling offerings. 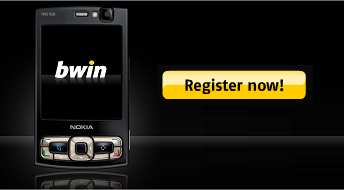 We’ve already covered the bwin mobile casino and bwin mobile betting service, today we meet bwin Mobile Poker. Whenever we see a new multiplayer mobile poker game, we get excited. We loved Aces Royal Mobile and Betsson Mobile Poker — what about bwin? Bwin have brought Texas Hold’em poker to our mobiles in glorious colour with sound effects too. It includes an off line mode so you can learn before playing for real. When you are ready to play you can use the “Quick Seat” option to get started quickly or select your own table type. 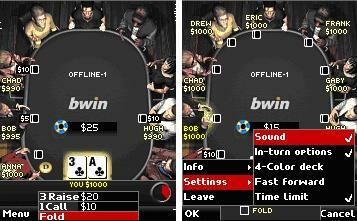 Bwin mobile poker also incorporates a chat function that lets you say pre-set phrases to other players. Main bwin Mobile Poker pro game plus mobile Blackjack. Various options including Ukash, PayPal, NETeller and credit/debit cards. No bonus offer — this puts Aces Royal and Betsson ahead.